The design of the Heavy Duty Brush Grapple attachment makes it ideal for tearing into roots, trash, and rubbish then loading the debris into your dump truck. 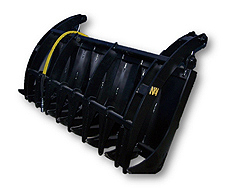 The shape of the Brush Grapple makes it easy to roll debris into tight piles if you are planning to burn. It’s easy-to-use design allows you to pick up debris without removing the soil. The full width single tine ensures you get all the debris without leaving anything behind. The brush grapple is constructed from 1/2 inch A-36 steel. It has a full width tine operated by two cylinders and a solid back for operator safety.